Add more killer combos. With Razer Hypershift, you can rebind each key to another function, or record multiple keystrokes into a macro, giving you access to trick after trick underneath your sleeves. Take your enemies by surprise with a wide array of moves on the battlefield. Features • Razer™ Mechanical Switches. • Up to 80 million keystrokes lifespan. 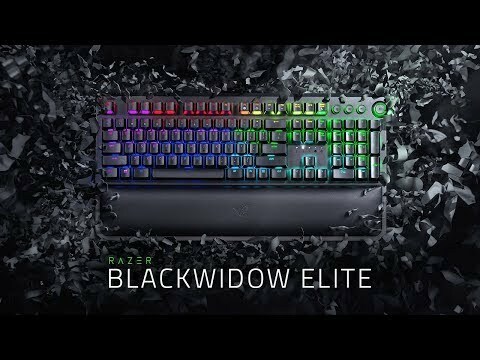 Razer BlackWidow Elite Chroma Mechanical Gaming Keyboard, Razer Orange, RGB, 10 Key Rollover, USB is rated 5.0 out of 5 by 1. Rated 5 out of 5 by TiDinzeo from A solid new keyboard. Bought to replace a cheap, faulty keyboard. The whole keyboard is solidly built, which does make it a little heavier than most regular keyboards, but that means it won't move around on the desk when typing. The keys are a delight to use, and everything works as expected.The only minor issues I have are the lights to show Caps lock, Num lock etc aren't labelled, so if you don't know which is which it can be difficult to know which are active and which aren't and the media controls, whilst having a lit ring around then, are marked with a different texture rather than a different colour/light which also makes it hard to tell which is which quickly, especially if it is dark.